However, a new report from an alliance of over 100 Irish civil society groups has criticised the Irish Government’s commitment to bring policy in line with the Sustainable Development Goals (SDGs). 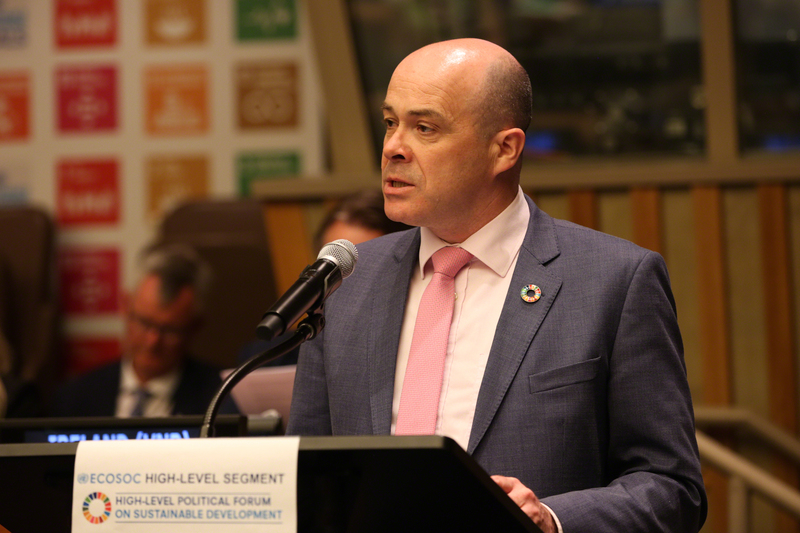 The Coalition 2030 report was released ahead of a presentation at a high-level UN forum by the Minister for Climate Action Denis Naughten on Ireland’s first review on steps the State has taken to implement the SDGs. Ireland was one of 47 countries that volunteered to present their review at the event. Speaking at the evet, Mr Naughten outlined the role of the goals to achieve a “safer, fairer, sustainable, and more prosperous” world, adding that he is focused on ensuring that the goals are implemented in Ireland. While acknowledging the “tremendous role” played by the Irish Government in getting global agreement on the SDGs, the Coalition 2030 report argued more work is needed, especially in the areas of climate action and environmental protection. Ireland’s National Mitigation Plan is criticised in the report for a lack of clear targets, while the National Implementation Plan on SDGs launched in April is said to have too many “significant” gaps between our ambition to act and actual implementation. The Coalition report points to the need for more ambitious solutions to tackle transport and agricultural emissions and calls for a ban on the use of fossil fuels.The report also calls for the State to review current policies on agriculture and forestry to ensure that they coherent with environmental goals. The report states that Government’s review also fails to address overfishing and destructive practices created by Ireland’s fishing industry. Ireland “topped the league table” for setting fishing quotas above scientific advice, a recent report by the New Economics Foundation states. Michael Ewing, the coordinator of the Environmental Pillar, said that Ireland is lacking in “policy coherence” and that more focus should be placed on interlinking the 17 goals across all State departments. “This issue is particularly manifest in Ireland’s poor performance in reducing greenhouse gas emissions and failure to stem the downward spiral in Ireland’s biodiversity,” Mr Ewing added. According to the National Parks and Wildlife Service, many of Ireland’s ‘red-listed’ species are threatened from agricultural practices, land-use change and forestry-related activities. The Sustainable Development Goals Index and Dashboards Report also found Ireland to be falling behind on its environmental commitments under the SDGs. The Sustainable Progress Index for 2018 launched by Social Justice Ireland earlier this year was also critical of Ireland’s progress on its environmental commitments. The report states that Ireland performs particularly poorly in terms of waste and emissions reduction and that the State has been playing catch up on the environmental front since it joined the EU.